Last week we attended a workshop called Worker Co-op 101. It was presented by Stacey Cordeiro, a co-op organizer from the Boston Center for Community Ownership in partnership with the Worker-Owned and Run Cooperative Network of Greater Boston. About a dozen attendees gathered around the large kitchen table at Red Sun Press on Green Street in Jamaica Plain to listen and learn as Stacey gave us an introduction to doing business as a cooperative. Some of us were farther along in our coop journeys than others. One of the attendees was Michael Monroe from Great Sky Solar, a new employee-owned social benefit company located in Boston. To start off: what makes a business a coop? And is it co-op with the dash in the middle, or not, like coop? I’m going to use them interchangeably according to whether or not I feel dash-y because it seems like either is fine, as far as I can see. Perhaps someone will set me straight on this. First, to be a co-op, it must be jointly-owned by its workers. It must also be democratically-controlled. It also operates according to the 7 Cooperative Principles which were adopted by the International Co-operative Alliance in 1995. What kinds of coops are there? There are three main kinds: Vendor (or Producer/Supplier), Worker, and Customer. Some examples of existing Vendor coops are Ocean Spray, Land O’Lakes and Florida’s Natural. In these, individual growers or producers pool together their products and share costs and profits. Here are a few Massachusetts-based Worker coops: Gaia Host Collective in Greenfield, Equal Exchange in West Bridgewater, and Broadway Bicycle School in Cambridge. In these businesses, the worker-owners share in the profits and have a say in how the company is run. Typically new workers come on board on a trial basis and then are voted in to become worker-owners, at which point they put in money as Member Equity. The amount can vary, but as Stacey put it, the idea is that it should be significant, but not inaccessible - like a good used-car price. 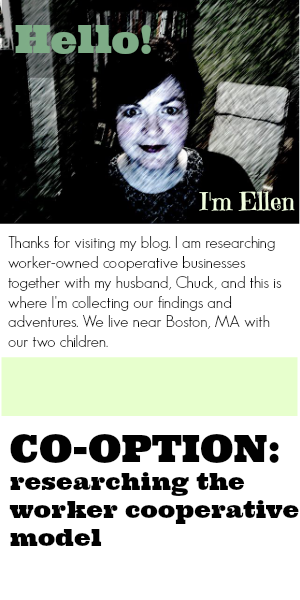 Two Customer coop examples are REI, and Harvest Co-op Markets. Customers pay to become members and get a patronage rebate or dividend refund according to how much they purchased over time and how well the company is doing. There are also housing co-ops that fall under this category. There are hybrid coops, like the in-progress Dorchester Community Food Coop and the Black Star Co-op Pub and Brewery in Austin, TX. Black Star has both worker-owners and member-owners. Check out the history of how the brewery started. I found it inspirational. Road trip, anyone? There are numerous organizations and people who are ready and willing to help folks start co-ops. The US Federation of Worker Cooperatives is the big one. They are holding their Worker Coop National Conference in Chicago at the end of May. To be entered into our drawing for a free book, subscribe to my blog in the box on the right. We’re giving away a copy of Owning Our Future by Marjorie Kelly and Locavesting by Amy Cortese to lucky subscribers. Both of these books inspired our “community cafe” idea. We’ll hold the drawing on February 28th. What’s the significance of that date? It’s when we’re screening the documentary Shift Change at the Unitarian Church of Sharon at 7pm. After the film, we’ll have a discussion with special guests Rink Dickinson, a co-founder and CEO of Equal Exchange, and Susan Sklar EE’s Interfaith and Community Sales Manager, and Stacey Cordeiro from Boston Center for Community Ownership. Join us if you’re in the area. If you are a New Englander considering solar for your home or business, I recommend contacting Great Sky Solar for a free site visit. Not only are they employee-owned, but because they are a social benefit company, or B-corp for short, they must consider society and the environment in addition to profit in their decision making process. If you tell them I sent you, I stand to earn a referral fee if you hire them. But I would have told you to contact them anyway, given their coop credentials! I'd love to hear from you. You can use the comment box below! Subscribe to my blog here! Enter your email address. Looking for a Co-op Near You? There's an app for that!